Does the Kim Young-ran Act Apply to You? On September 28, South Korean lawmakers approved an anti-corruption law, which is also called “Kim Young-ran Act”. According to this law, public servants can be subject to punishment if they receive money and valuables worth more than one million won at a time and if the values they receive amount to over three million won in a yearʼs period of time. There is a limitation on how much an individual can spend legally. One is allowed to spend 30,000 won for meals, 50,000 won for gifts, and 100,000 won for celebratory events or condolence money. The purpose of this law is to prevent the illegal solicitation of government employees. However, during the legislation process of the “Kim Young-ran Act”, the scope of the law expanded to journalists and private school employees. Because of this, several customs originally practiced in universities are now considered as a violation against this law. The first violation of “Kim Youngran Act”occurred in a ‘Kyungpook university’. A student was reported after buying a cup of coffee for a professor. Contrary to the publicʼs initial expectation, a relatively trivial incident happen to fall under the premise of this law. This example explicitly shows that college students could possibly be targets of “Kim Young-ran Act”. University students should be aware that they could be subject to punishment against the law even if their given actions do not have ulterior motives. 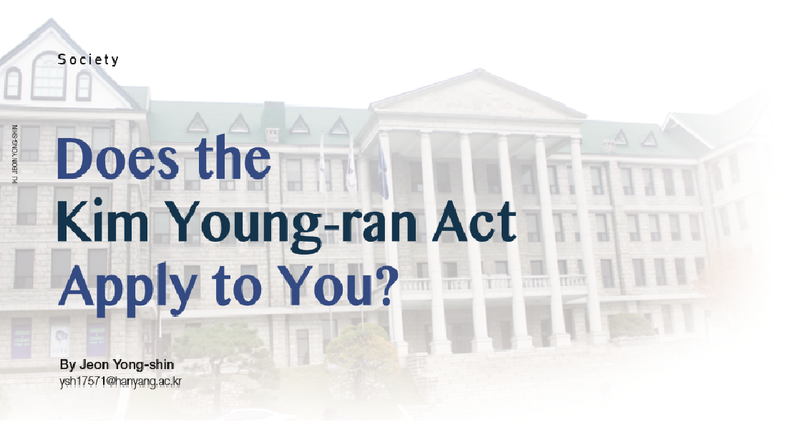 Which Actions are Violation of Kim Young-ran Act? So what type of actions by college students are subject to punishment? The problem in regards to early employment is the most controversial issue for the university students. Students who get jobs before graduation, have to work even though they have not graduated yet. It is hard to be at work and attend school at the same time. Therefore there is a custom that professors give credits even though the employed students do not attend classes. However, according to “Kim Young-ran Act”, this practice violates the law. Many junior and senior university students who are applying for jobs have strong objection to this. Seeing that the law has raised serious problems, the Ministry of Education announced that professors can give credits to students who get jobs before the graduation by amending the university’s regulations. HYU finished amending school regulations to accommodate the needs of the job seeking upperclassmen. Another action that university students should be careful of is giving professors money and valuables before grades are recorded. However, students are allowed to give professors either money or valuables after grades are recorded because such a gift can be interpreted as a studentʼs expression of gratitude. In addition, professors have considerable influences over graduates so it has been a custom for graduate students to treat their professors to a meal whenever the occasion is to occur. However, such treatment is also a violation of the law. Likewise, graduate students can take their professors out to eat after the examinations are finished. It is necessary to check out whether your action violates the law. For more questions, you can call the Anti Corruption & Civil Rights Commission, number 110 or 1398. What do students and professors think about the Kim Young-ran Act? Most students complimented with the purpose of this law. Students thought illegal solicitation should be exterminated and that this law would be the starting point to bring the change. However, several students pointed out some problems regarding this law. Some point out that this law can make our society more emotionally desolate. In fact, many people give gifts or treat others to meals out of the kindness of their hearts. However, now people worry that this law could eliminate affection among people and make society unneighborly and intolerant. Other students thought that the law has its limits in preventing corruption, especially illegal solicitation among high ranking government officials. This law just prevents illegal solicitation on a small scale. Since regulating big scale illegal solicitation is more important, they thought there should be a supplement for the law that could regulate big scale illegal solicitation. The professorʼopinions were similar to those of the students. A Proffesor in HYU who asked for anonymity said, “By establishing the law, personal engagement and get-togethers decreased and it became hard to meet and have a personal relationship with government employees.” He claimed that the law lacks flexibility. He pointed out that the law will make the society unyielding. As a solution, he suggested that the law be applied over time and that room should be left for various expectations. As mentioned before, “Kim Youngran Act” became a problem for university students who are employed before graduation. The solution to this problem is to amend school regulations. Our school administration swiftly responded to this problem by amending school regulations on November 4. This amended regulation came into effect on September 1, at the start of the second semester. According to the amended school regulations, student can hand in related documents regarding employment to the dean of their departments. After obtaining the dean’s approval, students can show the documents to their professors and they can receive credits for attendance. According to ʻTransparency Internationalʼ, South Korea ranked 37th among 114 countries in the global transparency index. Considering South Korea’s status and economic strength, such a ranking is a relatively poor performance on Korea's behalf. The Kim Young-ran Act, which was made to prevent the illegal solicitation of government employees, is still an incomplete solution to corruption. By supplementing deficient parts of the law, we can reform society and make it a corruption-free.